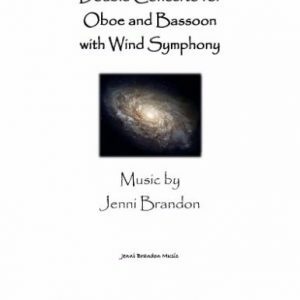 Jenni Brandon’s Double Helix for piano and bassoon is performed by Cory Burris at the Desert Hills Presbyterian Church in a piano recital, in partial fulfillment of his Master of Music in Performance degree requirements from Arizona State University. 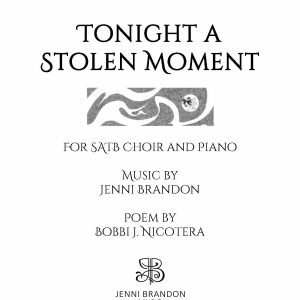 The performance is on Monday, April 22, 2019, at 4:00 to 6:30 PM, in the Sanctuary of the Desert Hills Presbyterian Church. The church location is 34605 N Tom Darlington Dr, Scottsdale, AZ 85262..
Recitals are subject to cancellation. Before making a special trip, please check with Corey Burris, Email: cmburri2@asu.edu or Phone: 602-625-2293. Double Helix for bassoon and piano was commissioned in 2014 by bassoonist Christin Schillinger to premiere and perform with Jed Moss on piano. This work is inspired by the sculpture of the same name by Long Beach, California sculptor Susan Hawkins. This sculpture (pictured on the cover of this score) depicts two separate figures dancing around each other, weaving their stories together, but never touching. 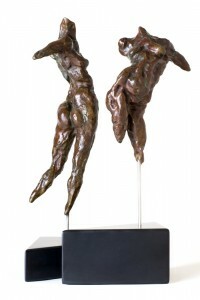 I loved the idea of using terms that are frequently used to describe dance and began to see the curves and lines and unique topography of these sculptures as fluid and moving. The bassoon and the piano become these two dancers, gracefully moving across a stage to tell the story of this beautiful sculpture. In “Prelude: Intertwine” the figures dance around each other, one at first (the piano), and then the bassoon joining in, flowing, and weaving in and out of each other. As they move into the “Entrechat” you can hear the fast movement of the feet as the dancer leaps from the floor, crossing and uncrossing the feet in mid-air as represented by the repeated staccato notes throughout this section. After much joyful leaping, the bassoon and piano take turns with solos in “Divertissement: Gentle Beauty.” Leading into the section “Soar” which begins innocuously enough, the dancers slowly begin to climb higher and higher, reaching a climax in this section as the bassoon dazzles with its range and the piano moves deftly from one end of the keyboard to the other. Finally, in “Postlude (Epilogue)” the original intertwine theme returns, allowing the dancers to shift and flow gently around each other, gently shifting back into the still image of the sculpture as the sound fades away.